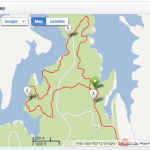 imbo today for a little Jordan Lake – New Hope Overlook Blue Trail Run. This trail features all the “Objects” that a trail runner should like. Roots, massive leaf cover (Providing the “Hidden” Root feature), switch backs, ups, downs and of course you can’t miss the downed logs that you have to jump OR the downed tress that you have to DUCK! The trail was quaint in that if you were not paying attention it would have been quite easy to venture off of it. Running this trail at night might be difficult, but sounds like fun. Jim was telling me that this trail is a good representation of the Weymouth Woods 100K Trail Race that I will be participating in January. I think I will be spending a little more time out here.